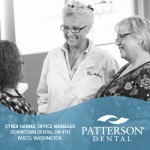 For Office Manager Cyndi Hanna and the staff at Downtown Dental on 4th in Pasco, Wash., dentistry is about far more than clean teeth and healthy mouths – it’s about people, friends and community. After 29 years working as a dental hygienist, Hanna transitioned to the front office, where she now serves as office manager. With past experience helping to build three other dental offices, and a desire to work with her good friend Nancy Shelton, DDS, Hanna was confident when she approached Shelton about building a practice that would bring something different to the Pasco area. As soon as Shelton was on board with the idea, the two began looking for property and making plans. “We sat down at lunch one day and sketched out what we wanted our practice to look like as far as the design, the placement of the operatories, and the flow of the practice,” said Hanna. The planning stage also involved contacting suppliers and representatives from at least four different companies – which made the process disjointed and confusing. To learn more about how the Patterson team helped with the development of Downtown Dental on 4th, watch the full story here. Do you have a story about building a new practice or about the ways in which your practice is making a difference? Share your story with us!